March Madness Sale on in stock units……………. Capable of burning wood coal or corn on the cob, specs on unit are on chart below the RS7300 units are in stock in Spring Hill Kansas ready to go, we can also help you with all parts and info you will need to hook it up…. We can load on trailer for you also…. Sale may end at any time for sale locally also…. Crown Royal Outdoor Burning Stoves also known as boilers, furnaces or hydronic heaters are the least expensive and most economical way to heat in the winter months. Energy efficient with readily available renewable resources makes it the number one choice for many consumers. Crown Royal Outdoor Burning Stoves are made to be located outdoors near fuel storage, keeping the mess outside. Underground tubing is ran from the stove to the building(s). Virtually any existing heating system can be converted into heating with a Crown Royal Outdoor Burning Stove. The traditional style Crown Royal Outdoor Burning Stoves are available in four models equipped with shaker grates. The shaker grates make it easy to burn coal. With capabilities to heat multiple buildings, these four models range from 2,000 square feet to 20,000 square feet. High Grade 409 Stainless Steel. Stainless Steel Heat Transfer Tubes. 4 Models To Choose From. Class A Insulated Chimney. Safety Latch Firebox Door. Insulated – Walls R30, Roof R40. Shaker Grate System with Removable Ash Pan. Works With Any Exiting System. No Carbon Monoxide Caused by Gas Fumes. Large Firebox & Loading Door. Cost Effective Heat Source. Multiple 1-1/4 Supply & Return Connections. Easily Removable Rear Access Door to Plumbing Connections. Light for Night Loading. Pool / Hot Tubes. Barns & Agricultural Building. Clean, Efficient & Safe. UL 391, UL 726 & CSA B366.1. Made in the USA. 2,000 – 3,000. 4,000 – 5,000. 8,000 – 10,000. 18,000 – 20,000. Domestic Coil 250,000 BTU. Crown Royal Stoves – Outdoor Coal Burning Furnaces. The shaker grate design ensures a complete burn of your coal. The automatic forced air blower extends burn time and creates greater efficiency with hotter burns by introducing air under the grate. Extra Large Removable Ash Pan for Easy Cleaning. Large Ash Pan Door for Easy Access. Ultra-Temp Insulated Stainless Steel Chimney. Stainless Steel Inner and Outer Shell. Double Wall Insulated Chimney. Easily Expandable, Interlocking Lengths Available. Manufactured with Safety in Mind. Eliminates the risk of a house fire, chimney fire, indoor smoke, or carbon monoxide poisoning. Firebox Safety Latch System ensures door from swing open to quickly. Each Crown Royal Stove has been rigorously tested and is UL & CSA certified. Allows for a cleaner more efficient burn inside the firebox. Allows secondary gases to be burned before escaping out the furnace chimney. Crown Royal Stove – Outdoor Coal Furnace owners can save approximately 50% – 100% of their annual heating costs. Reduce or even eliminate hot water bills and the dependence on foreign fuels. Depending on the outdoor temperature and size of the unit, our outdoor furnaces only need to be loaded once or twice a day. Eliminate dirt, bark, ash, smoke, soot, or insects from inside your home. It now stays outside where it belongs. Melt away snow from driveways and sidewalks effectively with proper installation requirements. Easy to use Controls. Thermostatically controlled offers a even heat throughout your home or business. Digital illuminated controls for easy reading. Economical and easy to replace. How Outdoor Coal Furnaces Work. As the price of fuel oil rises to new national record highs, more homeowners and businesses across North America are looking to alternative methods for heat. Crown Royal Stoves – Outdoor Furnaces , can dramatically lower your heating bill. 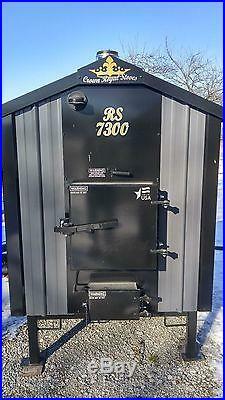 Unlike indoor burning furnaces / stoves, Crown Royal Stoves – Outdoor Coal Furnaces. Leaves no smoke or waste in the house and keeps all the mess and bugs where they belong, outside. SECONDARY BURN SYSTEM (TURBO DRAFT SYSTEM). The exclusive Turbo Draft System was designed into our outdoor furnaces to force fresh air over the open flames. By forcing the gases down to the fire below they are reintroduced into the burning fuel thus giving a hotter combustion and a cleaner burn. This means less heat is lost by escaping into the furnace chimney network. With our original shaker grate and ash pan design, fresh air is introduced under the fire feeding it oxygen as needed. When the damper is opened oxygen is introduced into the furnace ash pan system to feed the burning coal allowing the fuel to burn hotter and cleaner. Forced air and oxygen introduction in furnace is shown in blue on left image. ROUND DESIGN & WATER TRANSFER TUBES. The Crown Royal Stoves consists of a round firebox surrounded by a round water reservoir, also known as a water jacket. The combustion of coal heats the water in the surrounding water jacket, which is pumped via insulated underground pipes into your home or buildings. A round firebox and water jacket design means there are less weld points which reduces the amount of stress on the steel to ensure there is less cracking. The round water jacket design allows more water to be heated efficiently due to the fact that more water is touching the heated firebox surface. Water transfer tubes are designed into the Crown Royal Stoves , situated directly over the fire to allow even more water to be heated. As the fire burns, water flows through the transfer tubes giving an even distribution of heat in the water jacket. This design feature eliminates hot and cold spots in the furnaces water supply. OUTDOOR FURNACE CIRCULATION & HEAT TRANSFER. A four inch (4) gap separates the back of the firebox and the water jacket allowing the supply and return lines, located at opposite corners on the back of the furnace’s water jacket, to create a strong enough circulation, forcing the water over and around the firebox to transfer as much heat as possible. With the use of insulated underground pipes, hot water is moved from the outdoor furnace to your home or buildings, with the use of a circulating pump. The circulating pump is usually hooked to the hot water supply line , located on the bottom connection on the opposite side of the return line. This ensures that the water being used to heat your home or buildings does not have any cold spots. The item “SALE. Outdoor Wood & Coal Stove Furnace Boiler” is in sale since Tuesday, March 13, 2018. This item is in the category “Home & Garden\Home Improvement\Heating, Cooling & Air\Furnaces & Heating Systems”. The seller is “dono6zvz” and is located in Spring Hill, Kansas. This item can’t be shipped, the buyer must pick up the item.